In-Memory is the new buzzword of the modern age. It doesn’t matter on which database vendor you look at, everyone offers you In-Memory technologies. The same applies to SQL Server: In-Memory OLTP and ColumnStore Indexes. But what’s the idea behind these 2 new technologies in SQL Server? Does it make sense to use these technologies for your own SQL Server workloads? When does it make sense to use In-Memory OLTP, when does make it sense to use ColumnStore Indexes? 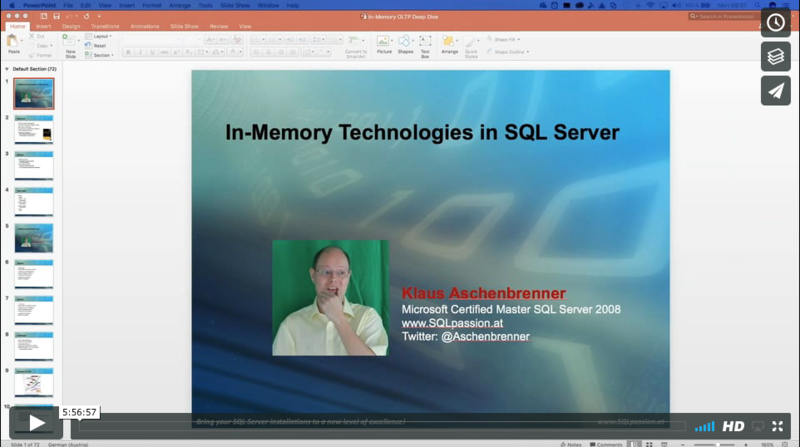 If you want to become an expert in SQL Server In-Memory Technologies you can buy now this 6 hour long deep-dive webinar for only EUR 490 + 20% VAT. This one-day long webinar is primarily for DBAs, Developers, and Consultants who want to speed up their SQL Server installations with In-Memory technologies. You don’t need to know anything about In-Memory technologies, you just need to have a basic understanding how to write T-SQL queries and stored procedures for SQL Server. After registration, we will send you the invoice via email. After payment you will get immediate full access to the webinar and the used slides & samples. Enter here the details for your invoice.